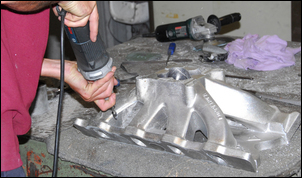 Last week in Metal Casting, Part 2 we saw how a sand mould for an aftermarket inlet manifold was formed. Now it’s time to watch the pouring of the aluminium and then see the results. 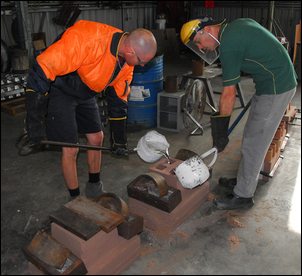 As with the previous parts in this series, the work was being done at the Matilda Foundry in Maryborough, Queensland. The casting is a Funnelweb 2V 351 Ford V8 inlet manifold by Parker Racing. The aluminium is melted down from ingots. 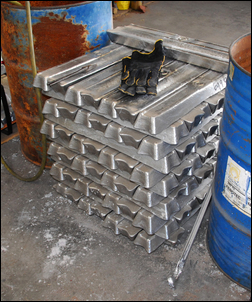 The aluminium most often used by this foundry for sand casting is AA601 (US standard 351). This material can be heat treated and machines well. 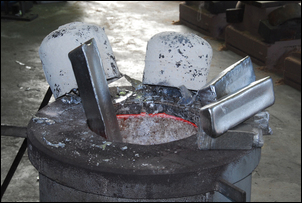 The ingots are melted in either a gas furnace (pictured) or an electric furnace. A layer of oxide floats on top; it insulates and keeps the air from the molten alloy. The temperature of the molten alloy is directly measured with a thermocouple. It needs to be at about 710 degrees C.
What look like oversize soup ladles are used to transfer the molten alloy from the furnace to the mould. With a casting of this size, two pourers are used; they time their pour with a countdown so that both mould runners are filled simultaneously. 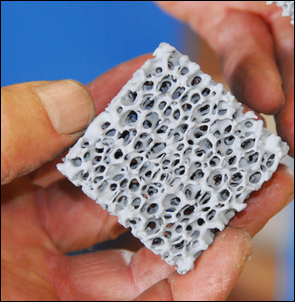 Ceramic filters have previously been placed in the runners, preventing any impurities from passing into the casting. 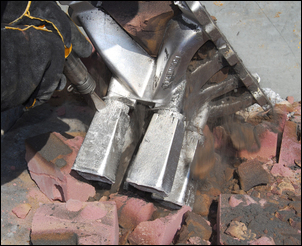 The filters also reduce the inclusions of air causing the formation of aluminium oxides. ..and pneumatic chisel. Note the sand falling out of the space between the intake manifold runners. ...bandsaw that is used to cut off the risers and runners. This material is remelted in the furnace. 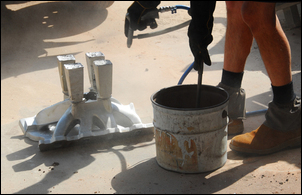 A die grinder is then used to remove the casting flash – the thin edges of metal that show the parting line of the sand mould. 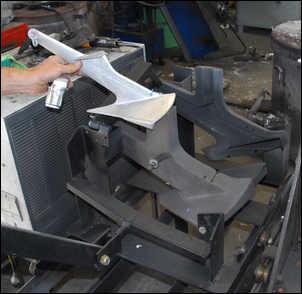 The foundry’s work with the casting is then finished – the casting is ready to go to the machine shop to be faced and have holes drilled. 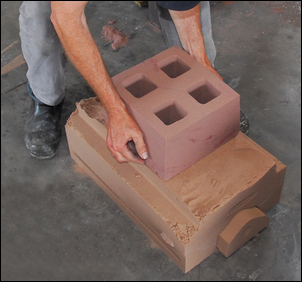 In this series we’ve covered sand casting – as its name suggests, castings made with sand moulds. 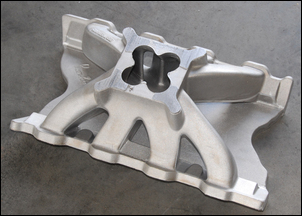 But another type of casting - called die casting - is often used, especially of small parts required to be made in large numbers. Die casting uses a two-part steel die. 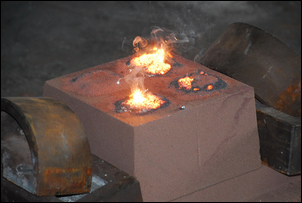 Gravity die casting uses a similar approach to sand casting in that the molten metal is simply poured into the die. Pressure die casting injects the metal under pressure. Die casting can achieve a better surface finish (the molten metal is in contact with a smooth steel surface, rather than sand), can be dimensionally more accurate, and yields little flash. 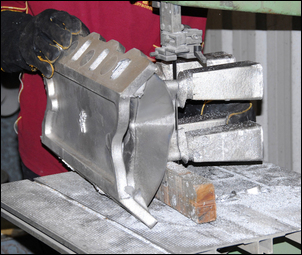 Because of its cooling contact with the metal die, small die castings can be removed only minutes after being poured. 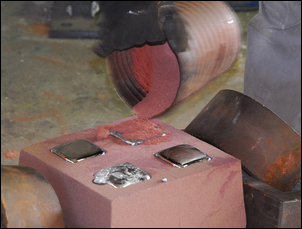 The dies are configured with rollers, levers and hinges, allowing the die to be opened, the solidified casting to be pushed out and then the die again closed, ready for another pour. 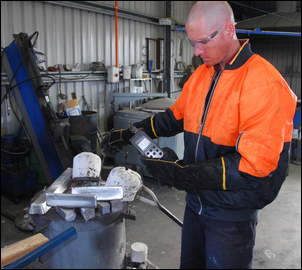 Matilda Foundry does some gravity die casting, usually in EA401 aluminium. 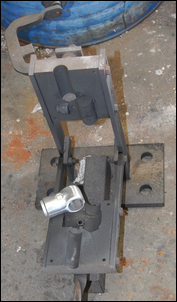 ...and this fitting (formed in two parts) that is used to support the roof handrail in trains. 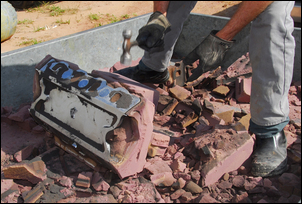 As has been seen from this series, developing the pattern for (say) a new intake manifold isn’t the sort of thing that you whip up overnight, get the sand mould made the next day and then have the finished casting back at your house a day later! However, knowing exactly how castings are produced in small quantities opens up a range of possibilities that may never before have occurred. Thanks to Matilda Foundry for their major help in preparing this series. Beautiful and sophisticated, but was it a technological dead-end?